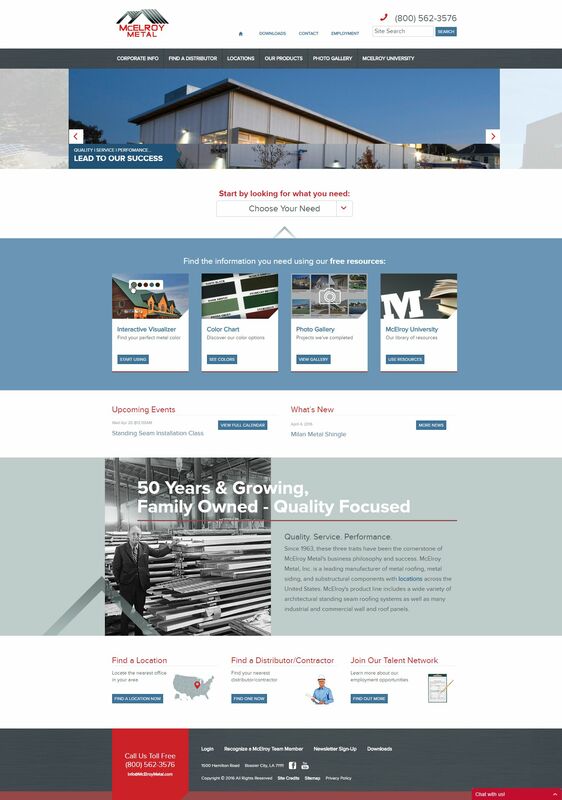 BOSSIER CITY, La., June 1, 2016 – McElroy Metal, a metal roof and wall systems manufacturer serving the construction industry, has relaunched its website at www.McElroyMetal.com. McElroy Metal has dedicated sections of the new site to the specific markets it serves: residential, architectural/commercial, post frame, retrofit/recover, green building/solar and insulated metal panels. The new site also contains many animations highlighting installation sequences and a color visualizer enabling visitors to view their personal homes or businesses with McElroy Metal products and colors. The McElroy University portion of the site has been expanded to feature information on Hands-On Installation Classes, Substrate and Coating Facts, Finish and Substrate Warranty Education and Educational Videos. To see all of the updates, please visit www.McElroyMetal.com.